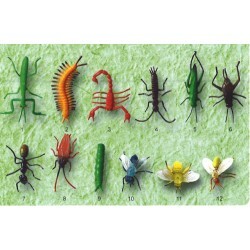 5cm good quality and details on 12 different plastic insects per bag with a display header. Display holds 24 pieces; good density squishy with a pleasant aroma. Assorted designs in each box. Individually boxed.Usually R14.50 excl vat - February 2019 special R10 excl vat while socks last. only sold in a display of 24 pieces.